This post is about how the Abbott decisions of the 1990s and the ensuing flood of state money into the Abbotts allowed the Abbotts to freeze their school taxes. This post provides shades of history as to why the Abbott districts, unlike poor non-Abbotts, pay nowhere near their full Local Fair Shares. This is a story about Abbott unfairness that isn't often told. Many people outside of the Abbott districts know that Abbott has caused their own taxes to soar, but few realize just what a huge break the Abbott districts themselves got. As usual, I got this data from the Department of Education via an OPRA request. I've put it all online on the Historical State Aid, Tax Levy, Tax Rate, and Spending Spreadsheets. 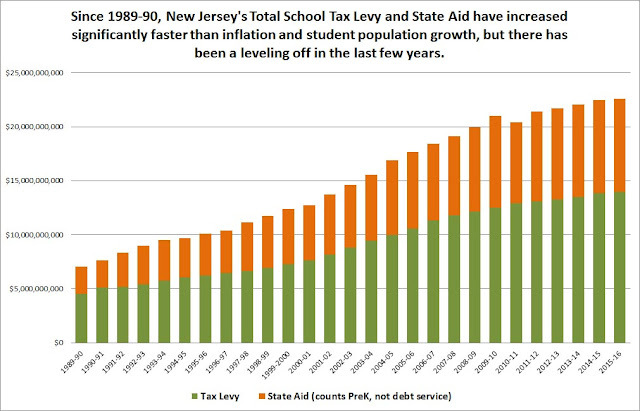 From 1989-90 to 2015-16, New Jersey's total school tax levy increased from $4,558,222,671 to $13,957,747,742, or a 206% increase. The median district's tax increase has been 224%, with Swedesboro-Woolwich having the biggest, with 1685% increase (from $800,000 to $15 million). Swedesboro's Equalized Valuation increased only from $92 million to $758 million (a factor of 8), so its tax rate has literally doubled, from 0.91 to 1.98. The biggest decrease has been Camden's, where school taxes have fallen by 62% (from $19.6 million to $7.5 million). Camden's Equalized Valuation has actually increased, from $898 to $1.7 billion, so Camden's school tax levy has fallen from 2.19 to 0.47. During these 26 years, inflation has been only 84% and the student population has increased by only a third. New Jersey's total Equalized Valuation (using adjustments for non-K-12 districts), increased from $509 billion to $1,165 billion, or a 128% increase. What is shocking is that how exempt the Abbotts have been from increasing their taxes. 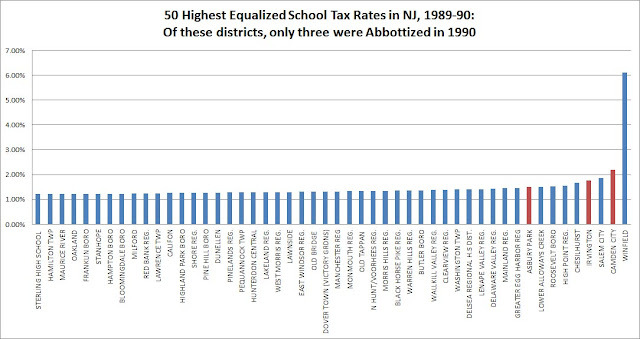 When the Abbott II decision came out most of the Abbott districts had substantially higher tax levies than they have now (adjusted for inflation). In 1989-90, the total Abbott tax levy was 9.4% of NJ's total. In 2015-16 it was only 5.6%. taxes are that high now. Since 1989-90, the median Abbott has only increased taxes by 53%. The Abbotts' Equalized Tax Rate has fallen from 1.11 to only 0.69, whereas the state's (weighted) Equalized Tax Rate has risen from 0.86 to 1.25. 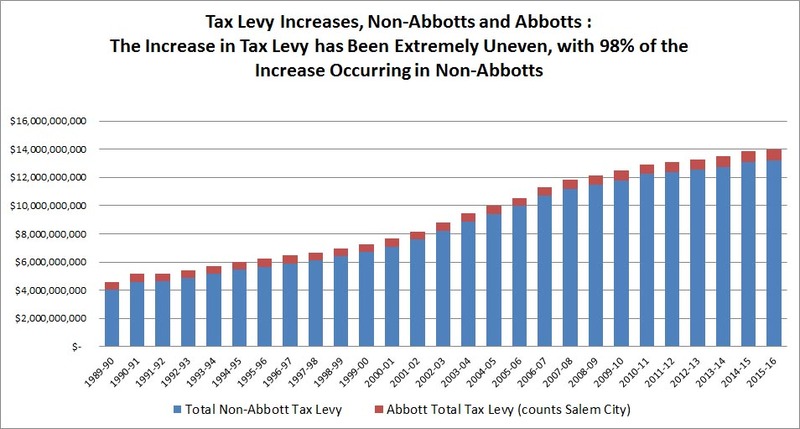 Most of the Abbotts have not done well in the last few decades, so it could be expected that their tax levy will lag the growth of the statewide tax levy, but poor non-Abbotts, by contrast, have been forced to accept significantly higher tax increases. 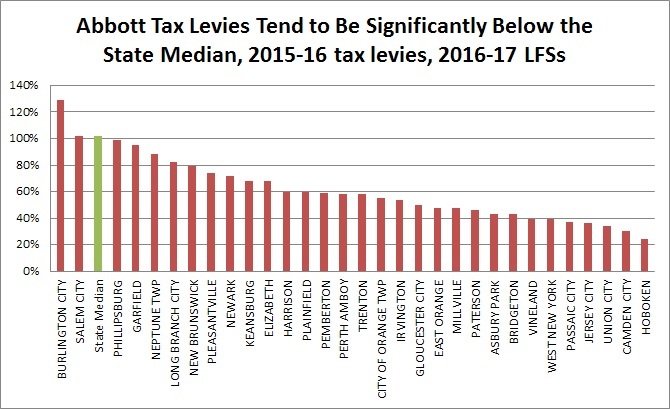 The 12 DFG A non-Abbotts (Atlantic City, Buena Regional, Seaside Heights, Woodbine, Paulsboro, Wildwood City, Lawrence Township, Downe, North Wildwood, East Newark, Commercial Township, and Fairfield Township) have increased their taxes by a median of 134%. Not a single DFG A or B non-Abbott has been able to cut taxes in nominal dollars, although there are a few where the tax increases have lagged inflation. Immediately after the Abbott II decision most of the Abbotts actually had to increase their taxes. For instance, Newark increased school taxes from $74 million to $82.7 million; Paterson increased school taxes from $33 million to $38 million; Trenton increased school taxes from $21 million to $25 million. On the other hand, over two years Jersey City slashed its school taxes from $90 million to $68 million. By 1993, however, Abbott tax increases were gone and the Abbotts were being flooded with more state aid than they knew what to do with. After this point, the Abbotts were allowed to keep their tax levies constant while the rest of the state - included the poorest non-Abbotts - had no choice but to increase taxes. 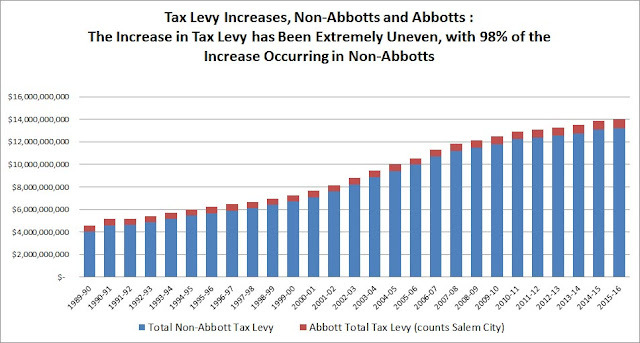 In 1993-1994, the Abbotts (not counting Salem City), had a tax levy of $550,030,670. Five years later, in 1998-99, their total tax levy would only be $551,208,043. Over the next five years NJ had a serious budget crunch, but the Abbotts still received a deluge of money and only had a tax levy of $570,705,470 by 2003-04. 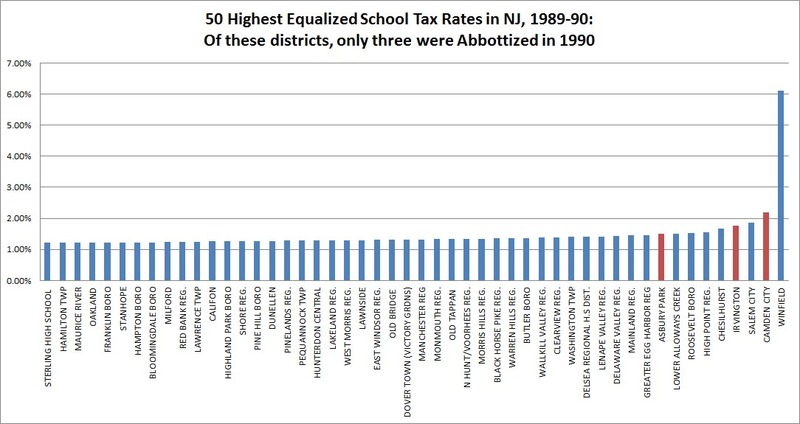 Even the best-off Abbotts, Jersey City and Hoboken, did not have to raise their taxes. From 1994-95 to 2000-01, Hoboken's tax levy stayed in a very narrow band in the low $22 million range. Jersey City's tax levy stayed at exactly $72,094,096 for nine years. Jersey City's tax levy would not exceed the $90 million tax levy it had in 1989-90 until 2009-10. 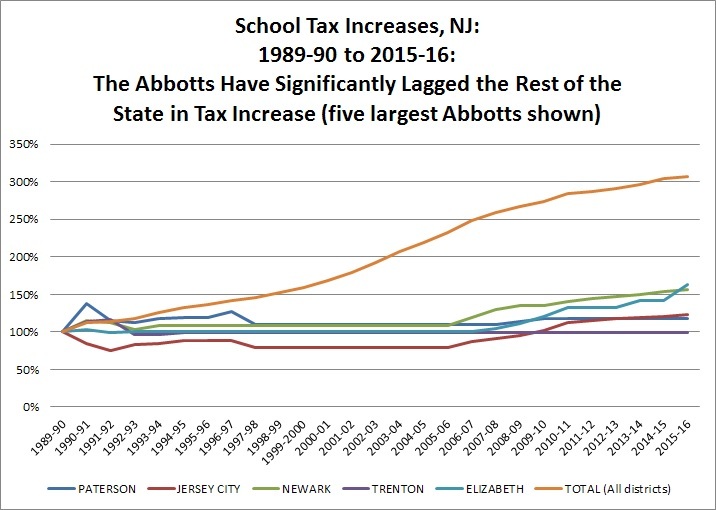 While school districts in NJ have accepted a massive increase in their tax levies that surges well beyond inflation and student population growth, of the 31 Abbott districts, only eight have increased taxes faster than inflation. 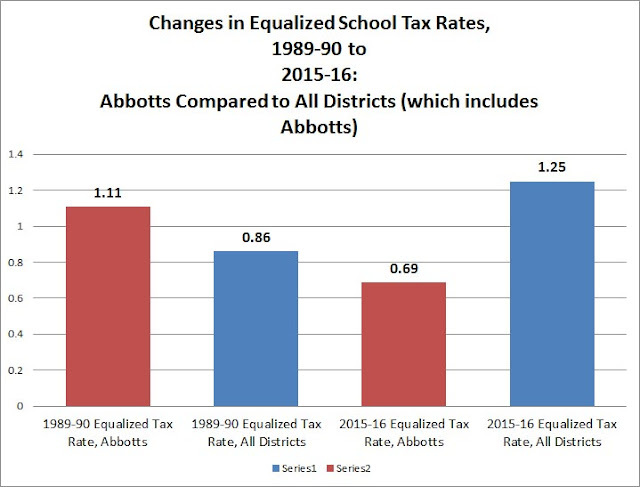 The other Abbott districts have had effective tax decreases over the last 26 years. As a consequence of the megamoney that the Abbott districts got in the 1990s and 2000s they fell significantly behind their Local Fair Shares and became accustomed to paying very little for their schools. Even today, eight years after SFRA passed, only half of the Abbotts even pay 50% of their Local Fair Shares. This gives taxes as a percentage of Local Fair Share. In conclusion, in discussing the history of Abbott funding, it's critical to remember that not all of that money made it into Abbott classrooms or even Abbott bloat. A lot of that money just offset taxes in Abbott districts or even just enabled Abbott districts to jack up their municipal taxes. The history of Abbott districts going years, even decades, without increasing taxes indicates that the Abbott districts themselves don't believe Abbott Theory.